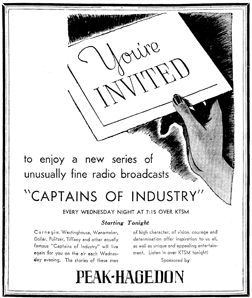 Captains of Industry aired first over KNX, then KEHE [Hearst Radio] from its newly built (1936) art-deco studios at 141 N. Vermont, in Los Angeles, adjacent to Los Angeles Community College. KNX and KFI were the two early Los Angeles powerhouse stations, broadcasting at 50,000 watts each in 1936. Radio broadcasting during the era of recovery from the Great Depression was a critical factor in that recovery. The early Radio networks were recovering as well. Cash-strapped and low on capital, the networks of the era turned more and more to independent programming producers to meet the Nation's voracious appetite for new and unique Radio entertainment. Allied Phonograph and Record Mfg. Co.
Broadcast Producers of N.Y., Inc.
Cleveland B. Chase Co., Inc.
Otto K. Olesen Co., Ltd. Note that World Broadcasting System, Inc. [as World Broadcasting Abroad] was already operating in Australia in 1934 as well. Several other transcription houses were also exporting programming to Europe, Great Britain, Australia and South Africa in 1934. Among the major transcription houses were several smaller recording firms catering to specific sectors such as religious programming and public service or public interest programming. Captains of Industry was envisioned as an inspirational, uplifting and public relations vehicle as all of North America recovered from The Great Depression. Recorded in the early 1930s by Atlas Radio Corporation of Canada, the transcribed canon comprised fifty-two biographical dramatizations of the more noteworthy industrialists and philanthropists of the late 19th century and early 20th century. Atlas Radio Corporation was founded in 1921 by David Louis Harris, a Jewish immigrant who became one of the pioneering radio, television and electronics manufacturers throughout Canada and The United States. There are some obvious omissions in the canon, limited as it was to fifty-two biographies. But the fifty-two industrialists the series selected clearly captured the breadth and diversity of industrialists of the 19th and 20th centuries. And though several of the subjects were somewhat eccentric characters in their personal lives, the series tended to simply ignore most of those eccentricities. The subjects were, for the most part, self-made millionaires who exemplified the American dreams of attaining hard-earned wealth from the humblest of beginnings and then establishing various philanthropic ventures to leverage that great wealth for the benefit of their fellow man. This was highly inspirational programming for a nation just getting back on its feet from the worst financial catstrophe in its young history. And indeed, the combined legacies preserved by just these fifty-two Canadian and American industrialists represent in excess of $1 Trillion today. These biographies were as inspirational and motivational in the mid-1930s as they are in 2011. Broadcast from late 1936 through at least 1939, the series served as a reminder of not only the tangible wealth of North America's industrialists of the era, but the intangible legacies most of them left to future generations. Those legacies stand today in the form of colleges and universities, enduring philanthropic institutions, and thousands of patents that paved the way for the technologies of today. KEHE Radio 780 [previously KTM, KNRC, and KFVF] was originally owned by Hearst Radio, Incorporated. Hearst also owned the Herald Express, Los Angeles' competitor to the evening edition of the Los Angeles Times. The art deco building at 141 North Vermont, Los Angeles was built specifically for KEHE’s studio and offices in 1936. 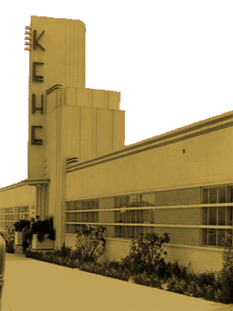 Dating from the early 1930s, Southern California Radio entrepreneur Earle C. Anthony had coveted KEHE's low Radio band at 780 kHz. Stations assigned to the lower Radio bands were generally clear channel stations with transmitter power of 50,000 Watts, or regional stations with transmitter power in the 1,000 Watts to 20,000 Watts range, usually requiring directional antennas and lower transmitting power from the sunset to sunrise hours. Earle C. Anthony's own KECA [K. E.arle C. A.nthony] had been a regional 5,000/1,000 Watt station assigned to 1430 kHz on the dial. The higher frequencies of the Radio dial were generally assigned to local stations in the 1,000 Watt range, or as was the case with KECA, lower power regional stations as described above. Anthony's other Los Angeles station, KFI, was--since 1931--a 50,000 Watt clear channel station at 640 kHz on the AM dial. 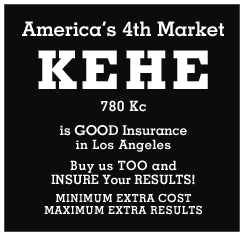 Anthony wanted KEHE's 780 kHz position on the Southern California dial for KECA. During 1938 Anthony finally persuaded Hearst to sell him KEHE, its building, license and frequency for $400,000 [approximately $6.4 M in today's dollars]. Anthony had no interest in KEHE itself, and took KEHE off the air in 1939. Anthony then successfully petitioned the FCC to delete KECA's assigned 1430 kHz frequency in the Summer of 1939, at the same time moving KECA to 780 kHz, the frequency previously assigned to Hearst's KEHE. 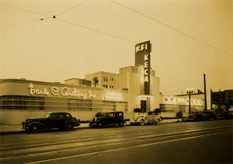 In December of 1939, Earle C. Anthony moved both KFI and KECA out of their original location in Anthony's downtown Packard Building at 10th and Hope, the site of Anthony's successful Packard Automobile dealership. Anthony moved both KFI and KECA into the former KEHE building at 141 North Vermont. Anthony later successfully petitioned to move KECA from 780 kHz to 790 kHz in 1941 and eventually increased its licensed power to 5,000 Watts for both day and night operations. The early F.C.C. 's proscription against the ownership of multiple stations in the same city by the same entity finally caught up with Earle C. Anthony in 1943--at about the same time that the F.C.C. and the Justice Department mandated the break up of NBC. Lifesavers' magnate Edward Noble purchased the previous NBC-Blue network as part of the break up of NBC, forming 'The Blue Network' which soon after became the American Broadcasting Company (ABC). The F.C.C. ordered Anthony to divest himself of KECA and Anthony sold KECA to Edward Noble. KECA then became one of the four initial Key Stations of The Blue Network. KECA eventually changed its call letters to KABC-790 in 1954. ABC had already changed its original New York Key Station's call letters from WJZ to WABC in 1953 [CBS' Flagship Station, WABC, had become WCBS in 1946]. The original call letters "W-A-B-C" had nothing to do with either CBS or the far later American Broadcasting Company. The WABC call letters referred to the old Atlantic Broadcasting Company owned by Radio manufacturer Alfred Grebe. CBS purchased WABC outright in 1929. WABC then became CBS' Flagship Station. Anthony's KFI clear channel station remained at the 141 North Vermont location until the mid-1970s. KFI was sold to Cox Broadcasting in 1973, a year after celebrating KFI's Golden 50th Anniversary in 1972. KABC AM 790 will celebrate its 100th Anniversary in 2022. We thank Jim Hilliker for his excellent scholarship and fascinating history of the interrelationship between KEHE, KECA, KFI and KABC in Los Angeles. As we see so often in the OTR sector of Vintage Radio preservation, names of historic figures are often either conflated with each other or simply incorrectly spelled. We continue to find this persistent aberration odd, given the very historic nature of Vintage Radio. Most of the circulating errors can be directly attributed to the OTTER log. 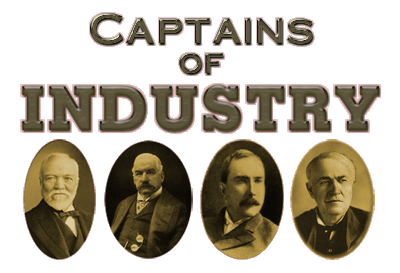 We've corrected all of the misspelled Captains of Industry subjects in the log below. The Story of William Wrigley, Jr. The Story of Mark Hopkins, Jr.